Media Credit: Photo by Anders Krusberg via the Peabody Awards used under a CC BY 2.0 license. When “The Colbert Report” comes to campus next week, some GW students will be working behind the scenes. The School of Media and Public Affairs will choose several students to work as production assistants before and during the show’s taping, the school announced Wednesday. SMPA students working on the show will be paid $10 per hour and work about 12 hours on Sunday and Monday. Stephen Colbert said on his show Tuesday night that he would return to D.C. to tape an episode of the show at GW on Monday. Students can enter a lottery to win free tickets until Thursday at 10 a.m. Only students can enter the lottery, and they can only enter once. Those attending must be in line with their GWorld cards by 1 p.m. on Monday, and the taping will end at about 5 p.m.
“Washington has been the Report’s second home, and I will be returning on Monday to show it the same affection the British did in 1812,” Colbert said on his show Tuesday. 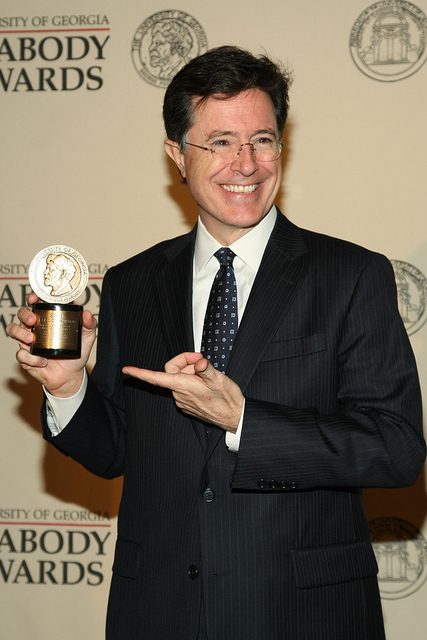 Colbert, who hosts the award-winning, nightly satirical news show, last spoke on campus in 2007 with NBC’s Tim Russert.